It is hard to imagine that Americans are any cleaner than the British, but read a set of American sales particular for anything other than a standard ‘ranch-style’ house, which is just a fancy name for a bungalow, and you’ll notice that with many properties, they have as many bathrooms, if not more than the number of bedrooms in the property. Okay, it’s cheating a little as a WC or cloakroom over here is a bathroom over there as well, but that misses the point. They have a far greater balance between toilets, bathrooms and bedrooms than we do. But there is no reason why – they don’t have a monopoly on the number of bathrooms you can have, so why restrict yourself just through conformity? The main reason for adding a bathroom or wet room to your home is because your children are now young adults, and no longer does one bathroom work between five of you. However, while you may think that bedroom space is sacrosanct, you only need up to 2.4msq to create a perfectly adequate wet room ideal for two or three kids, and wet rooms are a lot easier to keep clean too. Habits and trends change over time. Today where time is more valuable than ever, the time (and money) you save taking a shower means baths are more for indulgence than practicality. 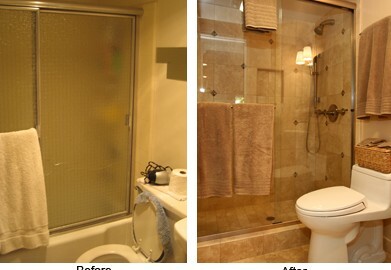 Today we are converting more bathrooms into shower rooms than ever before. Nothing affects the potential value of a property more than a scruffy and worn-out bathroom or kitchen. It is a well-documented fact that a quality kitchen and stylish bathrooms and shower rooms help to sell a property more than anything else, just don’t go over the top and take advice from an expert. So maybe you have bagged that property bargain because the kitchen and bathroom need upgrading. Moving into a new home is the perfect time to have a new bathroom installation or wet room installation, and is always a sound investment. Why not? Yes, that is actually an extremely good reason to have a newly fitted shower room or bathroom. With a change here you can alter the whole atmosphere of a floor in your property. There are no rules which govern when you can and cannot have a new bathroom, shower room or wet room, so if the mood takes you and you feel like creating something special in your property, where better to start? Here at Baines Bathrooms we have more years than we care to remember behind us and over that time we have enjoyed the challenge of creating something extra-special in usually what is quite a confined space. Good planning and design – included in our services – can make such a difference and present options you may not have previously considered. So why not take the first step and if you live in Bristol or surrounding areas and want qualified plumbers and experienced bathroom fitters to give you a great design and accurate quote for the cost of fitting a new wet room or bathroom, just give us a call.